We loved our suite. We chose the executive suite which came with a master bedroom on the ground level, a single bedroom on the first floor, and a double on the mezzanine. 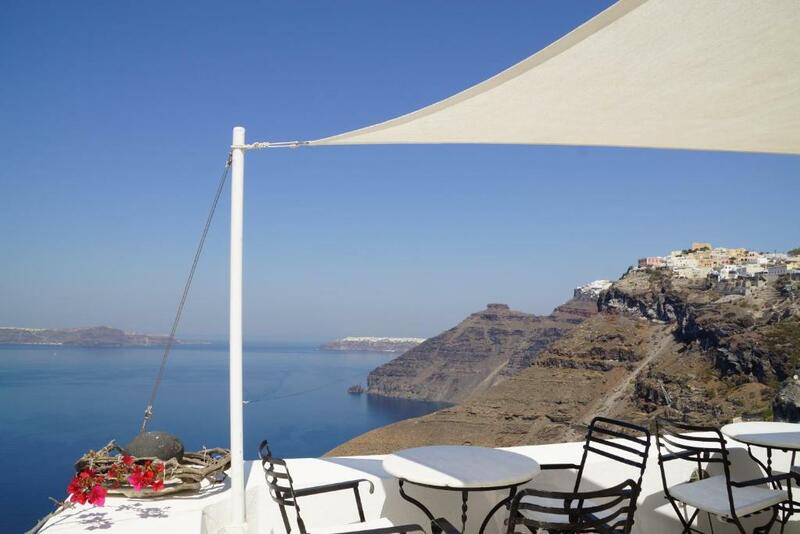 The single bedroom came with a private balcony overlooking the caldera. The suite came with a hot tub jacuzzi. The stairs on the ground floor balcony came down to a cave swimming pool (not heated). Breakfast was served in the room. Options were fair. Upon arriving, prior arrangements had been made with the hotel for the porter to meet us at Thira square. We also arranged for hotel transportation. Staff were lovely. The view from the hotel was spectacular. We thought the hotel was brilliant, great location and all the staff were so lovely and helpful. Would definitely stay here again! This is an interesting hotel with large suites, i.e. a bedroom, cave bathroom, and separate dining/lounge area. Some public parts of the hotel overlook the caldera which is absolutely amazing. Staff were excellent - a special thanks to porter Yanni who carried our bags down and back up the steep path. Breakfast was served on the terrace with amazing views and was a choice of nice fresh options. Would highly recommend this hotel. unique, beautifully decorated hotel, it is what you call a boutique hotel. 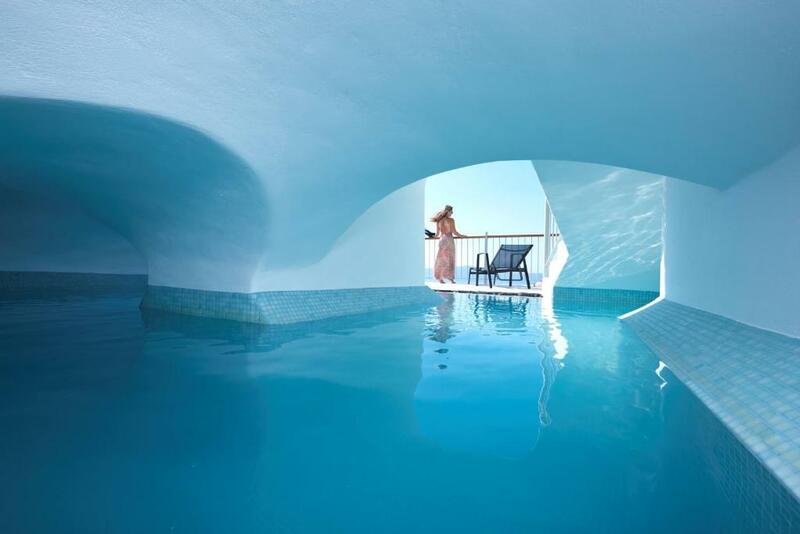 located right by the ocean side, you don't have to go far to see the beautiful Aegean sea, and the breathtaking views of famous Santorini, staff were very friendly, they also offer breakfast in bed service with no extra charge. room was spacious, and you get a semi-private front yard too. the hotel has its own swimming pool, ocean viewing point/balcony with lounge chairs. Exceptional view, great staff always willing to assist, clean room and facilities, breakfast was brilliant. Amazing views from our balcony. Great breakfast delivered to the room. The rooms were very clean and the beds were comfortable. The pool area was clean and the views were amazing. The pool was cold and the spa was hot. The staff were friendly and helpful, The man that carried our bags was a champion. A very large room with three beds. The staff were very helpful, the breakfasts amazing and the views from the upper balcony stunning. Very quiet but central. Really enjoyed our stay. Good location, good breakfast, helpful and friendly counter, thanks for their help. 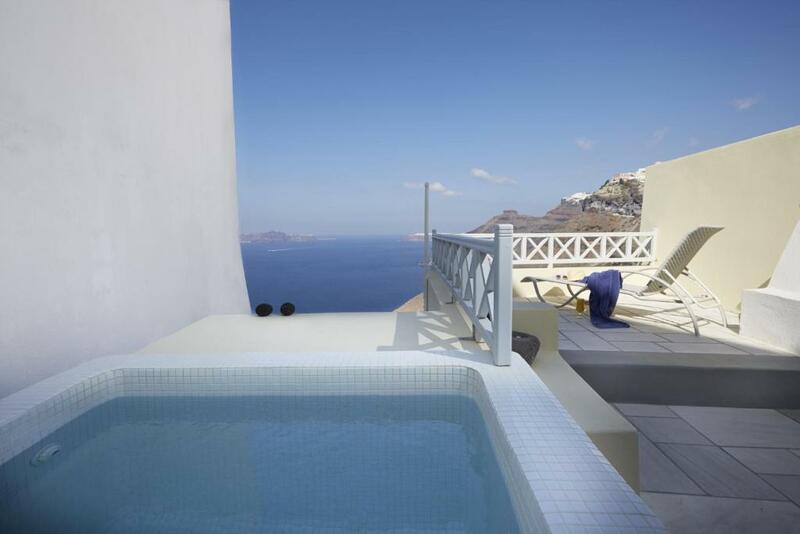 Even we are a little bit disappointed for the view of our room, but still a good me to stay in Santorini. Lock in a great price for Cori Rigas Suites - rated 9 by recent guests. 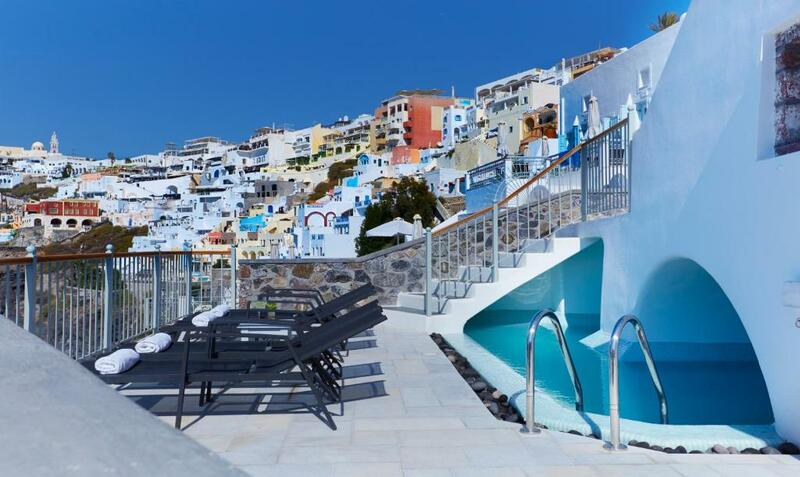 One of our top picks in Fira.Located on the cliffs of Fira, Cori Rigas Suites features a freshwater swimming pool and a furnished sun terrace with spectacular views of the Santorini volcano and the Aegean Sea. Free WiFi is available in its public areas. Most units enjoy a view of the Volcano and the sea, while some of them open onto a courtyard or a shared rooftop terrace with sea view. Each unit is tastefully furnished and features pieces of art from the owner's private collection. Some include an outdoor hot tub. The former Captain’s House has been carefully restored with the use of local volcanic materials, wood and marble, making it a living sample of local architecture. Cori Rigas Suites provides a made-to-order breakfast. The staff offers a personalised service and local knowledge. The hotel is located in the centre of Fira, close to many taverns and local shops. Cori Rigas Suites has been welcoming Booking.com guests since 25 Jun 2009. When would you like to stay at Cori Rigas Suites? -beauty treatment upon request and at extra charge. Please note that there is no capacity for extra beds or baby cots in this room type. Please note that there is no capacity for extra persons in this room type. A baby cot can be provided at extra charge, upon prior request. -a beauty treatment upon request and at extra charge. A baby cot can be provided at extra charge, upon prior request. - a beauty treatment upon request and at extra charge. Please note that this room type cannot accommodate an extra bed. A baby cot can be provided at extra charge, upon prior request. Please note that daily housekeeping service is provided. Please note that there is no capacity for extra beds in this room type. Baby cots can be provided at extra charge, upon prior request. Please note that baby cots can be provided at extra charge, upon prior request. This Suite cannot accommodate extra beds/baby cots. A former Captain's House, restored according to traditional architecture, using local materials like wood and marble. A property of elegance and simplicity, yet offering all modern amenities & facilities as well as breathtaking sea views. 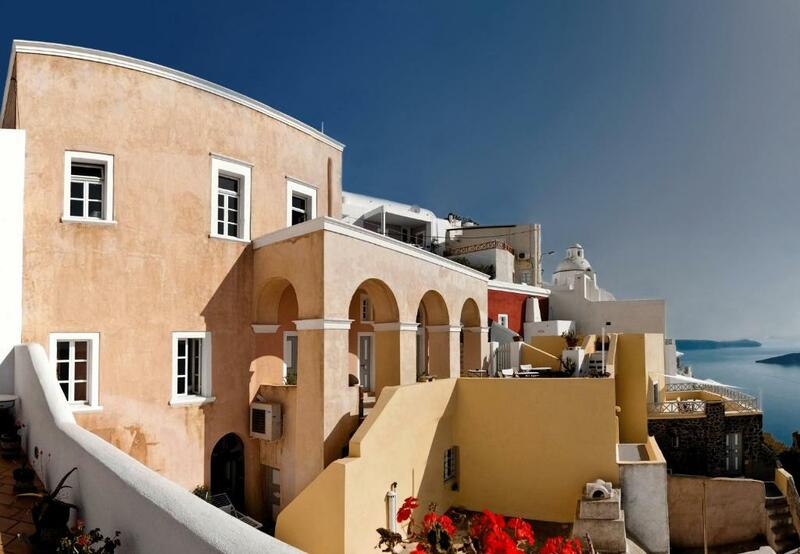 Quiet neighbourhood, in the traditional part of Fira town, within walking distance to all places of interest, restaurants, means of transportation. House rules Cori Rigas Suites takes special requests - add in the next step! Cori Rigas Suites accepts these cards and reserves the right to temporarily hold an amount prior to arrival. This is not a complaint of the hotel. 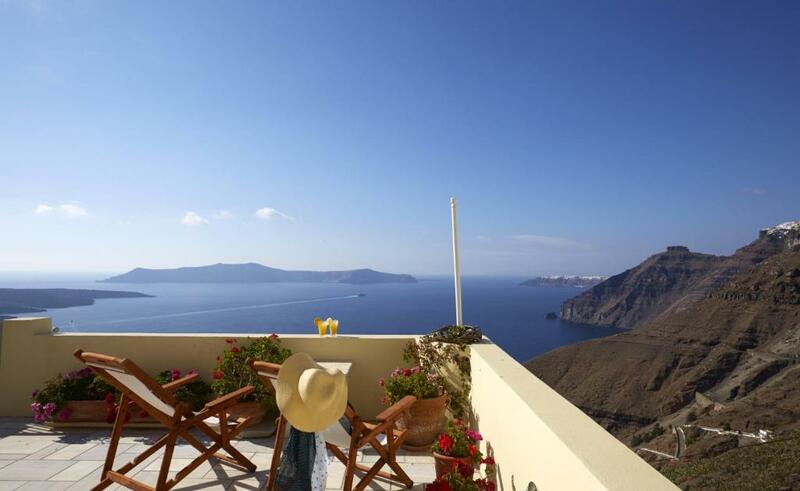 Rather, a reminder that Santorini and most hotels on the caldera, overlooking the sea, are situated on cliffs. So be prepared for a lot of walking and climbing narrow and steep steps. It was quite the work out for us. 😅😊. Not stroller or wheelchair friendly. The supply of hot water is complicated. Great location, beautiful view from breakfest and pool area. Very good breakfest. Stuff helped to curry luggage. Cleaning could not be better. the bathroom has no window, and the shower was looking cheap, with a dirty shower curtain pulled over, that always stuck on your skin while taking a shower. hot water does not come straight on, you have to switch the power on, and wait for 10 minutes for it to boil. our room didn't have the ocean view. but has a nice front yard, however for the price we paid, should have got the option to pick from. the pool was oddly located at down the stairs of the cliff, under a cave looking building and it's very small, you cannot really swim in it. Just how far away the pool was from the room. Breakfast, the room was perfect. Wifi could be spotty, especially during peak times. Hot water for showers would turn cold mid way. Be advised that this hotel is on a cliff and you need to walk up and down numerous steps, but that's part of the charm and hardly the fault of the hotel. Location!! In the middle of Fira, very near to bus station for the 20 min ride to Oia. Shops and restaurants close by. Spectacular views from our balcony. Breakfast served on the terrace. The apartment style room was very spacious and well equipped. Complementary wine upon arrival. Porters who carried your bags up and down the bazillion steps on the cliff. Helpful reception desk with arranging tours and transfers. The 100+ steps down to the hotel room would be a challenge if you had bad knees. (worth it) The room was a little noisy, we weren't sure if it was the air-con or the pool pump, just a constant hum. Not far from the Fira bus station, you can see the sea, the breakfast is good, the staff is very kind. The only issue for us was that the bed was too stiff for our tastes and the internet was a little spotty, but overall we loved our stay and it was excellent value. Loved the hotel and the staff was amazing.